ProTech Data offers a wide range of solutions and installations for structured cabling to both small and large projects. Our professional team of experienced technicians can help you plan and design a network cabling solution for your data center, server room or for your entire office. We provide a complete array of services including installation, infrastructure design to a full line of computer services. ProTech Data can help you to create, establish and manage any cabling project, including Cat 5, Cat 6, Plenum cable and fiber optics to suit your specific requirements. ProTech Data Network Services doesn’t just design and install your network and structured voice cabling services. Our team of highly-trained technicians will also test and certify each and every installation we do. We use the latest technology and tools to test your project. We guarantee the quality of all of our installations and each one of our cabling solutions come with lifetime warranty. In addition to designing, installing and testing your network cabling solutions, ProTech Data Network Services can also create and install cable management solutions that can be used to secure, store and organize all of your network cabling. Horizontal and vertical cable solutions are available through our wire management systems to use with your cabinet enclosures or equipment racks to keep all of your cords and cables neat and organized for maximum performance and efficiency. 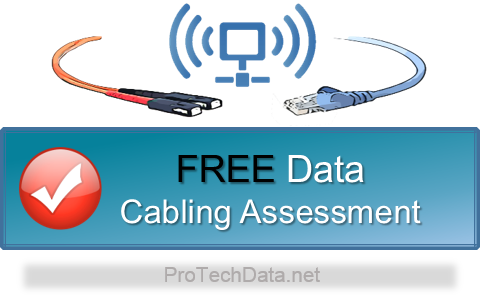 ProTech Data provides affordable professional one stop shopping for all your network installation and low voltage cabling needs. Our team offers quality technical expertise advice and support.